The drive Kwangsub “Mike” Ahn has in the classroom is one he developed while serving in the military in his native South Korea. “I am not a very physically fit person, but even with such barriers I think I was able to go through the entire service because I learned a lesson of mental strength and perseverance,” explains Ahn. He found Richard Bland College of William & Mary through an agency connecting international students with opportunities for higher learning in the United States. Ahn considered several options, but RBC was the frontrunner for several reasons. The small professor-student ratio was a draw along with the foundation he could build at RBC to complete a degree focusing on accounting and finance. Ahn is a member of the RBC Class of 2020. He plans to transfer to William & Mary and major in accounting. Ahn is active on the RBC campus as a member of the International Club and is a math tutor. 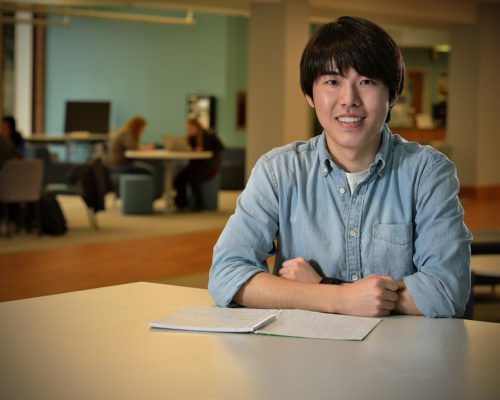 As he prepares for employment in the business world, Ahn finds inspiration in many areas, including his Western Civilization class taught by Professor Daniel Franks. At 25, Ahn expects he would have faced discrimination in South Korea for beginning a university program years older than most freshmen. It is why he applauds America and RBC for embracing non-traditional students.